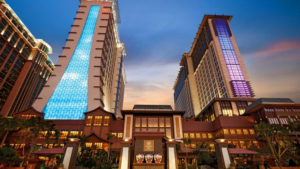 All 2019 World Forum program and social activities will take place at the Sheraton Grand Macao Hotel– a 5 Star luxury hotel. World Forum rates at the Sheraton include complimentary full daily breakfast (1 guest for single occupancy and 2 guests for double occupancy) and WiFi. Delegates who are members of the Starwood Preferred Guest or Marriott Rewards programs will have access to all Sheraton Club Services. At this time, the Sheraton is pleased to offer complimentary shuttles from Macao ferry terminals, the mainland China border and airport (subject to change). Registered delegates are responsible for booking and paying for their own hotel rooms. Reservations must be made by March 15, 2019. *Rates expressed in Hong Kong dollars. Rates in $US are based on conversion rates on January 1, 2018 and may fluctuate over time. In the Sheraton online booking system, you will have an opportunity to confirm conversion rates into other currencies. Room rates for pre- and post-conference dates of April 5, 6, 12, and 13 (Friday and Saturday nights) will be higher, ranging from $US205 to $US248. These nights will sell out fast. Before booking a room, please first consult the Schedule section to determine when you will be arriving and departing. Then click on the “Book Now” button below and make a reservation using one of the following credit cards: Visa, MasterCard, Amex/Optima, Japan Credit Bureau, or Diners/Sundin/Amoco. Note that your credit card will be booked for the full stay upon confirmation. If you are extending your stay to include a Friday or a Saturday night at the Sheraton, you will be charged at the World Forum rates for Sunday through Thursday nights and at the higher weekend rates for the other nights.